Developed by Eidos Montreal; Published by Square Enix; Released August 23, 2011 for Xbox 360, PlayStation 3, and PC. What’s it about? : Deus Ex: Human Revolution is a futuristic role-playing game where you play as Adam Jensen as he tries to solve the mystery behind an assault on Sarif Industries, the company where he serves as security director. Thanks to this attack, Jensen finds himself critically wounded and mechanical augmentations save his life. 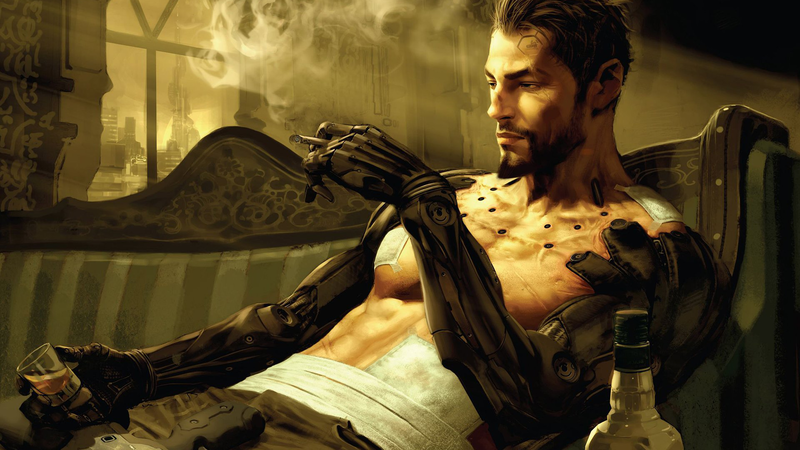 As the story evolves, the morality behind human augmentation comes into question and Jensen has to question his motives and decisions, all while trying to save the love of his life. Why’d you put it down in the first place? : If you were around before the game launched, it was promoted exceptionally well with incredibly engaging and thought provoking live-action trailers. Between that and the fact that I played Invisible War when I was growing up, which was apparently a terrible game compared to the original, I simply had to pick this up. My friends were also excited for it, so we decided to all chip in and buy it together. That night we got through roughly a quarter of the game, but we wanted to wait until the next time we got together to continue playing. One month passed, then two, and eventually I saw that this wasn’t going to happen. It was too late, I had moved on to other more riveting games. Was it worth coming back to? : Absolutely. I had always enjoyed the stellar environments and soundtrack to Human Revolution, and coming back to the game almost two years later was a blast from the past. The voice acting may not be top tier, but this is a world I wanted to explore, a world I needed to explore. Playing with friends watching tended to cause me to lean towards a more combat heavy approach to every situation. Many enemies were gunned down despite my desire to do otherwise. My return provided me the perfect opportunity to alter my strategy. Instead I turned towards stealth, the part of Human Revolution that shines. Spending 30 minutes on a single engagement is not something I would normally enjoy in a game like this, but with Deus Ex I did, and that speaks volumes for the quality of this game. All things considered, I think Eidos Montreal did a wonderful job at staying true to the roots of the franchise while providing some new improvements. Long ago the team released the only piece of downloadable content, titled The Missing Link, which I intend to visit before finally moving Human Revolution out of my backlog and into my gaming catalogue. For $20 you get a deep and thorough experience. There were some major issues with the boss battles, as they were developed by a different studio, but you really can’t nitpick since $20 is a steal for Human Revolution. Cyberpunk has never looked better.